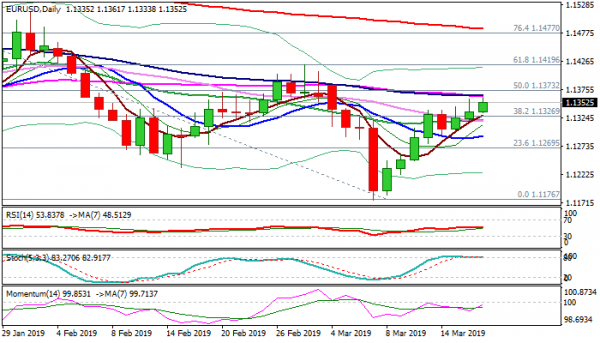 The Euro maintains bullish tone and extends advance to hit fresh recovery high at 1.1361 on Tuesday, underpinned by strong gains last week, as well as better than expected German/EU ZEW data in (German Mar economic sentiment -3.6 vs -11 f/c/EU economic sentiment Mar -2.5 vs -15.1 f/c). Fresh advance of British pound adds to positive tone, as techs gain momentum and MA’s turn to bullish setup. Fresh bulls pressure initial barrier at 1.1364 (converged 20/30SMA’s) and eye other pivotal barrier at 1.1373 (50% retracement of 1.1569/1.1176), close above which would open way for probe through thickening daily cloud (currently spanned between 1.1400 and 1.1413) and possible test of key Fibo resistance at 1.1419 (61.8% retracement of 1.1569/1.1176). 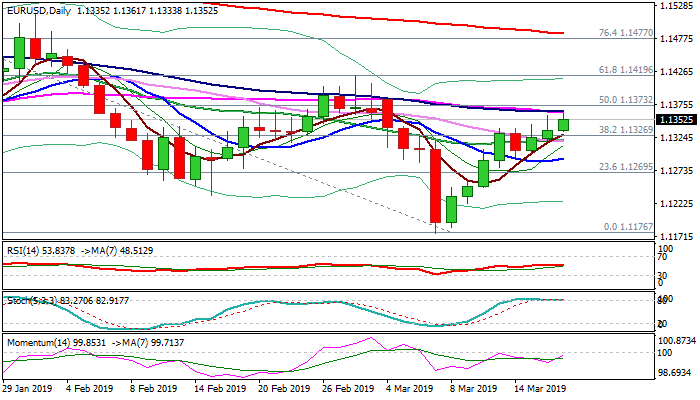 Overbought daily slow stochastic requires caution, with solid supports at 1.1330/26 (rising 5SMA/broken Fibo 38.2%) required to hold and keep bulls in play and guard pivotal support at 1.1317 (converged 20/30SMA’s).